See What's New for Meetings in L.A. | meetL.A. See What's New for Meetings in L.A.
For meeting professionals and event planners, Los Angeles offers world class venues in a dynamic city that’s constantly evolving and expanding its possibilities. Even frequent visitors who think they know LA can always discover something new in this exciting metropolis. 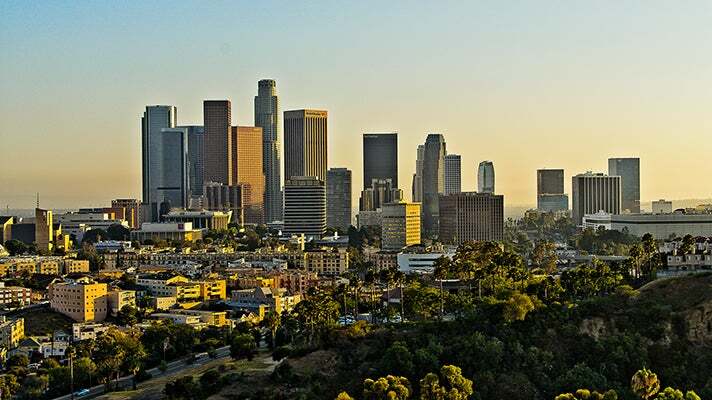 Read on to find out more about the latest developments in the City of Angels. Last year, Los Angeles welcomed a Space Shuttle and a battleship, opened a spectacular new urban park, launched a new state-of-the-art thrill ride, and much more. Here are just a few of the must-see attractions that are already open this year. The California Science Center is now the permanent home of the Space Shuttle Endeavour, which landed at Los Angeles International Airport (LAX) last year and made an extraordinary journey through the streets of LA, before going on public display in the Samuel Oschin Space Shuttle Endeavour Display Pavilion. The adjacent “Ecosystems” gallery features an exhibit called “The California Story” that highlights how the state was key to the shuttle program. An 8-minute time lapse video showcases amazing footage of Endeavour’s famous transport from LAX to the Science Center. 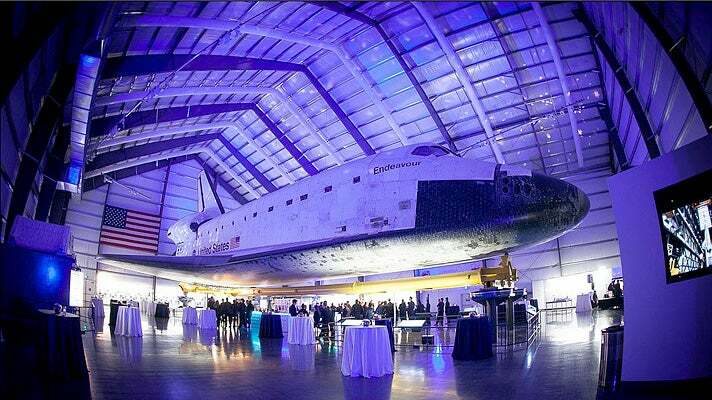 The Samuel Oschin Space Shuttle Endeavour Pavilion is available for receptions for up to 800 guests and dinner for 500 guests. Guests may dine right under the Endeavour and enjoy several exhibits within the pavilion while mingling. Although the Science Center can’t close the pavilion for daytime private events, conference guests can add an “Endeavour experience” and see the shuttle along with the public at a guaranteed time. 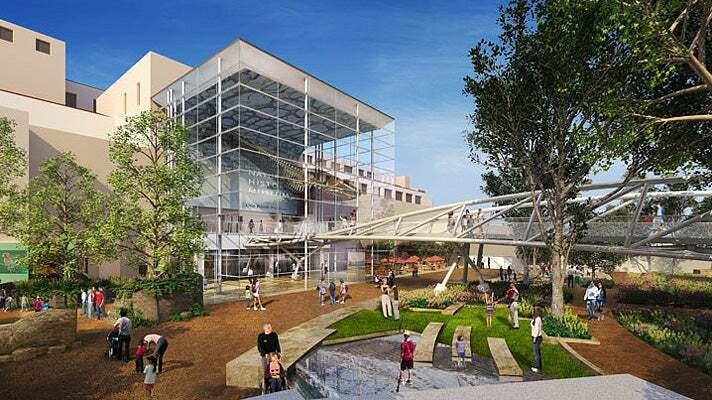 The California Science Center can also host meetings and conferences for up to 700 guests in the 7,500 square foot Donald P. Loker Conference Center and for 250 guests or less in the Erteszek Family Foundation Muses Room. Daytime programs can seamlessly segue into evening receptions or extravaganzas for up to 5,000 guests featuring private gallery viewings, IMAX presentations or elegant sit-down dinners. The museum's proximity to the Los Angeles Convention Center and its generous capacity make evening parties a specialty. Visitors and locals alike can now enjoy Grand Park, a 12-acre urban oasis in Downtown that stretches from Grand Avenue at the Music Center to Spring Street at City Hall. The park's restored Arthur J. Will Memorial Fountain has already become a favorite amongst photographers, especially in the evenings, when its changing colors create a magical scene. 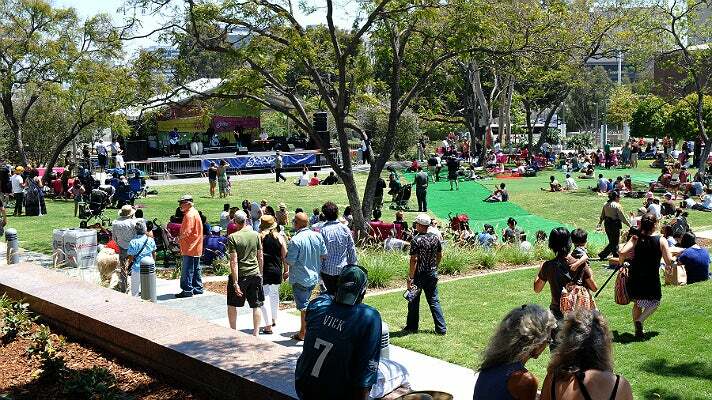 Grand Park was designed to accommodate the needs of many types of performances and events, with state-of-the-art multimedia technology and multiple options that provide for flexibility in set-up. The Music Center, in conjunction with the county, oversees and operates Grand Park to create a dynamic, inclusive environment for community events, cultural experiences, festivals and holiday celebrations. The Music Center also oversees Grand Park’s spaces, which can be rented for events and activities by public and private parties. Whether you're a longtime regular or it's your first time visiting Universal Studios Hollywood, don't miss Transformers™: The Ride 3D, an immersive, next generation thrill ride that blurs the line between fiction and reality. Fusing HD 3D media and flight simulation technology, this epic ride creates an experience unlike anything this planet has ever seen. Based on the popular movie franchise, this mind-blowing Transformers adventure puts riders in the middle of the ultimate war zone. Universal Studios Hollywood can host a variety of events, from as few as 100 people up to 20,000 guests. The world's largest working movie studio and theme park is ready to make your next meeting or event a blockbuster success. Show pavilions like Animal Actors and the Special Effects Stage are popular venues for meetings and, as a bonus, guests are treated to a unique show. Other event options range from a family-friendly company picnic or a lavish awards dinner, to a red carpet movie premiere, holiday party or even a buyout of the entire theme park. The festive Streets of the World has a capacity of 2,000 guests, who can sip pints of ale in an authentic Irish Pub, take a stroll down a quaint London street and dance in a romantic Parisian courtyard. The Streets of the World are located just steps away from the stunning Globe Theatre (capacity 500-700 guests), which can be incorporated into your event. Built in 1940, Battleship USS Iowa was designated the "world's greatest naval ship" due to her big guns, heavy armor, fast speed, longevity and modernization. During her 50 years of service, Battleship USS Iowa hosted Presidents Franklin D. Roosevelt, Ronald Reagan and George H.W. Bush. She became known as the “Battleship of Presidents,” having welcomed our nation’s Commander in Chief more than any battleship in American history. Battleship USS Iowa now calls Berth 87 at the Port of Los Angeles in San Pedro her new home. Battleship USS Iowa opened to the public in July 2012 as an interactive naval museum and living memorial. 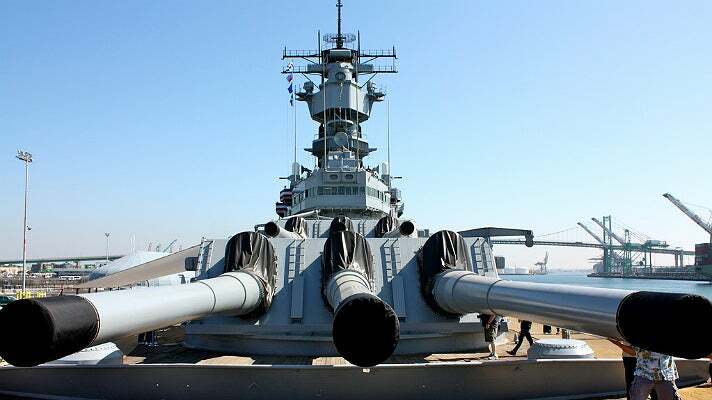 Located within walking distance of hotels and the Ports O’ Call Village in San Pedro, Battleship USS Iowa offers a remarkable historic setting that's sure to leave a lasting impression on attendees. Event arrangements for groups of any size are available, including business meetings, casual luncheons, formal dinners and spectacular events. Catering menus feature local growers and utilize sustainable practices. Located in Exposition Park, the Natural History Museum of Los Angeles County (NHM) is in the midst of the greatest transformation in its history. Following $168 million in renovations and expansions, NHM is marking its 100th anniversary in July with a year-long series of special events and exhibitions. This year, NHM opens its North Campus, a 3.5-acre urban wilderness that includes a pond for native and non-native turtles, a vegetable garden and a 1913-style garden. As the oldest cultural institution in Los Angeles and the largest natural and historical museum in the country, the Natural History Museum offers a spectacular and unique setting for your meeting or event. While conference spaces are available in the daytime, most private events at NHM take place at or after 6 p.m. One of the most remarkable things about events at NHM is that they take place inside the galleries — not in adjoining banquet halls. Available museum spaces include the Grand Foyer, the Rotunda, the African Mammal Hall and the North American Mammal Hall. These spaces can be used in a variety of ways, either by themselves or in tandem, depending on guest count and event flow. Whether your guests are seated at the Chimpanzee Table or dining under the dinosaurs, they will never forget the experience. NHM can accommodate 1,200 guests inside and 600 guests outside. The $1.7-billion New Tom Bradley International Terminal at Los Angeles International Airport (LAX) is a world-class terminal that offers better passenger convenience, amenities and services, and solidifies LA’s role as an international gateway. The architectural design of the 1.2-million-square-foot facility, the centerpiece of LAX's multibillion-dollar LAneXt™ capital improvement awareness campaign, features arched stainless steel that stretches over column-free structures, mimicking the waves of the Pacific Ocean. Designed to achieve LEED Silver Certification, the New Tom Bradley International Terminal is anticipated to be completed in phases, with the West Gates and a Great Hall featuring dining, shopping and other passenger amenities scheduled to open in spring 2013. The East Gates, security, U.S. Customs and Immigration areas are set for completion by the end of 2013. In total, the new terminal will offer 18 gates, nine of which will comfortably accommodate passenger loads for new-generation aircraft, such as the Airbus A380 and the Boeing 787 Dreamliner.